A Devon hotel which helped inspire the legendary series Fawlty Towers has welcomed back one of the show's stars. 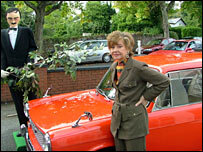 Actress Prunella Scales who played Sybil, arrived at the Hotel Gleneagles in a replica of the Austin 1100 flayed by screen husband Basil in one episode. John Cleese, who played Basil, based the series on the Torquay hotel which the Monty Python team visited in 1971. He described the then owner Donald Sinclair as "the most wonderfully rude man I have ever met". Mr Sinclair, who died in 1981, is said to have thrown fellow Monty Python colleague Eric Idle's suitcase out of the window "in case it contained a bomb" and complained about Terry Gilliam's table manners. Ms Scales said that the enduring appeal of the Fawlty Towers series, created by John Cleese and Connie Booth - who played waitress Polly - was the "very good writing". "It was all about men and women, power and pain," said Ms Scales, making her first visit to the hotel. Ms Scales side-stepped a few hiccups that would have been worthy of Fawlty Towers. First the red Austin 1100 she arrived in stopped shy of the red carpet, which had to be hastily re-arranged by hotel staff. She was unfazed by a replica Basil. Then she lost no composure when her speech was interrupted by the voice of US actress Joan Rivers on the public address system, giving her approval to the hotel's £1m revamp. Brian Shone - who co-owns the hotel with Terry Taylor - said that 20 years ago Torquay wanted Fawlty Towers "wiped off the map". "We have done Torquay a favour, we have put it on the map," he said. "You cannot get rid of the spirit of Basil, so you have got to embrace him." Barbara DePaulis, who was invited back to the hotel which catered for her daughter's wedding in the 1970s, described how one guest had to be rushed to hospital with a broken nose and her husband was asked to serve in the restaurant. 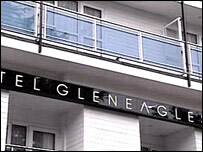 She told BBC News: "It was the first wedding reception that the Gleneagles had had. They did not have enough staff or food. "It was just hysterical. In the end we had to laugh. "I can understand how it got the name Fawlty Towers after that." The actual hotel seen at the start and end of the series was the Wooburn Grange Country Club in Buckinghamshire, but that burned down in 1991. 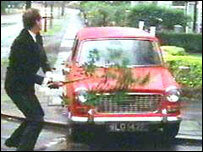 Despite only running for 12 episodes, Fawlty Towers regularly tops polls of favourite TV programmes.